With other decal makers coming out with sheets of roundels and other common markings, it was not suprising that Leading Edge would join in and produce a sheet of roundels. These are for RCAF planes and usable on a wide variety of aircraft. There are two different sheets; one for 1/48 and one for 1/72. As you can see, there are a variety of different sizes for different aircraft. 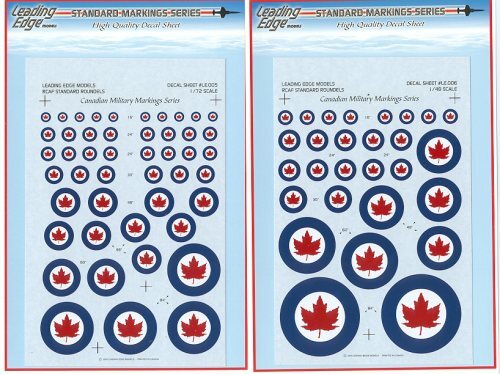 All the roundels are clearly marked as to their diameter and should come in very handy, especially when it comes to replacing some of the less than great decals that come with some kits!